Some people grind or clench their teeth when they feel anxious or tense. Others grind their teeth at night. Most people grind or clench their teeth unconsciously. They may not even realize they do it at all, until they notice sore and stiff jaw muscles or headaches. You may be surprised when your dentist tells you that you grind your teeth. A night guard is an appliance used to help alleviate grinding or bruxing, which is the term used to describe grinding your teeth at night. A night guard may also be worn during the day, in situations where you may be likely to grind your teeth, such as if you power lift weights or drive long distances. Teeth grinding can cause pain and tension in the jaw muscles and can contribute to chronic headaches. Teeth grinding, over time, will wear down your teeth, and your dentist may need to use dental bonding to repair your teeth. 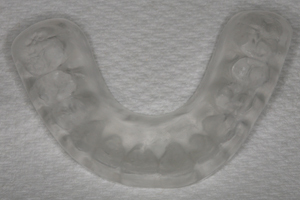 Wearing a night guard can prevent this wear and tear on your teeth. Buying a night guard from the drug store is not recommended, because it won't fit your mouth as well and won't be comfortable to wear. A custom-fitted night guard is specially designed to fit your teeth and your mouth, using a custom impression of your teeth to create an exact fit. "I just wanted to let you know how much the night guard has helped. I no longer wake up with headaches, and my jaw hurts 90% less. (Of course with Fibro, I still have unrelated headaches and every other ache possible), but the relief the night guard has given me is amazing. Thank you for encouraging me to get it." - Karen B. "I lost my night guard and I just received a replacement. My jaw feels less tense, my teeth hurt less, my gums feel better, and my headaches have disappeared. What a difference the night guard makes. Thank you Dr. Hurley! - Gina V."